Bloodstock agents are equine professionals who buy and sell Thoroughbreds on behalf of their clients in exchange for a commission. Bloodstock agents analyze pedigrees and conformation to assess the value of Thoroughbreds being offered for sale, both privately and at public auctions. Agents also bid on horses in the auction ring for their clients and may initiate or broker deals for horses being offered privately. Many agents advise their clients on breeding plans for their broodmares, and they may facilitate the booking of these mares to stallions that are in high demand. A bloodstock agent may also appraise horses for insurance purposes or direct their clients to providers of insurance. Agents usually receive a commission for the referral, paid to them by the insurance agency. Bloodstock agents must travel extensively to represent their clients at sales across the country and internationally. They must constantly network and build relationships with industry professionals to maintain and expand their sales business. Additionally, agents must be able to work closely with veterinarians, farriers, and other equine health professionals to evaluate the fitness of individual horses. Bloodstock agents can specialize in racing stock, breeding stock, or a combination of both areas. Some agents may offer U.S. based services while others have specialty knowledge about Thoroughbreds in other major racing areas such as Europe, Australia, and Japan. On the racing side of the equation, bloodstock agents can specialize even further. While some agents focus on identifying prospects for clients who race what they purchase, they also may work with clients who seek horses that they can resell in a short period of time for a profit, which is known as “pinhooking.” For instance, these clients would purchase a weanling to sell as a yearling, or a yearling to sell as a two-year-old in training. On the breeding side of things, a bloodstock agent may be involved with advising clients on breeding plans for their mares, as well as buying and selling stallion seasons. There are no specific educational requirements for becoming a bloodstock agent, and there is no formal licensing program. Anyone with a solid knowledge of the Thoroughbred industry and a good eye for evaluating horses can become successful in this business. Most bloodstock agents work their way up in the Thoroughbred industry, starting out by taking a position on a top breeding farm, becoming a trainer’s apprentice, or working for a sales agency. After gaining some hands-on industry experience, many choose to seek out an apprenticeship with a seasoned agent to learn the ropes of the bloodstock business. A bloodstock agent should have an excellent knowledge of Thoroughbred pedigrees, equine anatomy and physiology, industry news, and current market trends. Agents must also have strong marketing, sales, and business management skills to be successful in this career. Agents should also be familiar with the guidelines for the ethical operation of a bloodstock agency; these guidelines were drafted by the Sales Integrity Program. A bloodstock agent’s success is closely tied to their reputation in the industry, so it is in their best interest to conduct business honestly and in accordance with these guidelines. Unless under contract to a major player in the Thoroughbred industry, bloodstock agents are self-employed and do not earn a set salary. They are compensated for their efforts by a commission on the sale, generally five percent. Some agents also are kept “on retainer” for a set price and provide advice on a number of horses for a particular buyer or seller. Experienced agents can make $80,000 to well over $100,000 while agents just starting out in the industry can expect to earn a more modest salary in the range of $30,000. As an agent gains experience and develops more contacts in the industry, their earning potential increases dramatically. As self-employed individuals, bloodstock agents must take into consideration various additional expenses such as paying for their own healthcare insurance, maintaining a business vehicle, and other travel costs such as airfare and hotel stays. 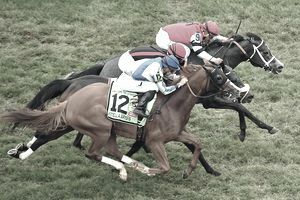 After several years of slow growth, the Thoroughbred industry has begun to show signs of improvement. Those in the Thoroughbred business believe the industry is beginning to rally. Sales for bloodstock agents are expected to show positive growth in the coming years.